And right on cue, we return for our annual Top Fantasy Baseball Prospects list. This marks our 15th annual rankings, and as we always do, we’ve cranked it up this year, going 90 deep for 2019. Note that these rankings represent our take on the top prospects prior to Opening Day. This season, we’ve slipped to 41 returnees from our 2018 rankings (two fewer than last year), and the number of players graduating to the bigs from last year’s Top 85 prospects also dipped a tad (down two to 22). A whopping nine more prospects (22) fell off the list this year, suggesting that as we expand the list, the chances of swinging and missing increases. As a result, we rose to 49 newcomers (seven more), not a big surprise given the increased size of this year’s list. Graduating from last year’s top 85 list (last year’s rankings in parentheses): Ronald Acuna, OF, Atlanta Braves (1); Gleyber Torres, SS, New York Yankees (5); Lewis Brinson, OF, Miami Marlins (12); Walker Buehler, SP, Los Angeles Dodgers (14); Austin Meadows, OF, Pittsburgh Pirates/Tampa Bay Rays (20); Willie Calhoun, OF, Texas Rangers (22); Willy Adames, SS, Tampa Bay Rays (26); Juan Soto, OF, Washington Nationals (32); Anthony Alford, OF, Toronto Blue Jays (33); Franklin Barreto, SS/2B, Oakland Athletics (36); Scott Kingery, 2B, Philadelphia Phillies (37); Ryan McMahon, 3B, Colorado Rockies (39); Jack Flaherty, SP, St. Louis Cardinals (45); J.P. Crawford, SS, Philadelphia Phillies/Seattle Mariners (55); Jake Bauers, 1B/OF, Tampa Bay Rays (63); Jesse Winker, OF, Cincinnati Reds (66); Chance Sisco, C, Baltimore Orioles (70); Christian Arroyo, SS, Tampa Bay Rays (71); Dustin Fowler, OF, Oakland Athletics (72); Harrison Bader, OF, St. Louis Cardinals (76); Tyler Mahle, SP, Cincinnati Reds (80); and Miguel Andujar, 3B, New York Yankees (85). Dropping off the list this season: Leody Taveras, OF, Texas Rangers (29); Kolby Allard, SP, Atlanta Braves (31); Kyle Lewis, OF, Seattle Mariners (38); Franklin Perez, SP, Detroit Tigers (42); Jorge Mateo, SS, Oakland Athletics (44); Kevin Maitan, SS/3B, Los Angeles Angels (46); Nick Gordon, SS, Minnesota Twins (49); Cal Quantrill, SP, San Diego Padres (50); Alec Hansen, SP, Chicago White Sox (53); Blake Rutherford, OF, Chicago White Sox (56); Chance Adams, SP, New York Yankees (57); Yadier Alvarez, SP, Los Angeles Dodgers (59); Tyler O’Neill, OF, St. Louis Cardinals (62); Mickey Moniak, OF, Philadelphia Phillies (68); Anderson Espinoza, SP, San Diego Padres (74); Alex Faedo, SP, Detroit Tigers (75); Jay Groome, SP, Boston Red Sox (77); Stephen Gonsalves, SP, Minnesota Twins (78); Riley Pint, SP, Colorado Rockies (79); Corey Ray, OF, Milwaukee Brewers (81); Luis Ortiz, SP, Milwaukee Brewers/Baltimore Orioles (82); and Carson Kelly, C, St. Louis Cardinals (84). Now go pour yourself a super jumbo coffee and sit down to enjoy our tome of prospects. Last year’s rankings are in parentheses. 1. 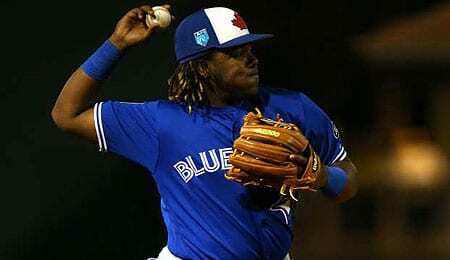 Vladimir Guerrero Jr., 3B, Toronto Blue Jays (2): Guerrero is now the top prospect in the game, and we all eagerly await his MLB debut after he was super productive at Double-A and continued to rack up impressive counting cat totals at Triple-A. At this stage, few stadiums can contain him (see video below). 2. Eloy Jimenez, OF, Chicago White Sox (3): Don’t be shocked if Jimenez winds up as the AL ROY. He hit brilliantly at Double-A and then was even more impressive at Triple-A. 3. Fernando Tatis Jr., SS, San Diego Padres (16): Blessed with elite speed and power, Tatis has a chance to be a generational talent at shortstop. The normally durable prospect had some injury issues last year, but really improved his base running skills. 4. Forrest Whitley, SP, Houston Astros (19): This gargantuan righty, selected out of a Texas high school, has an overpowering fastball. Whitley has been compared to Josh Johnson, who had an excellent career that was ultimately derailed by injuries. 5. Bo Bichette, SS, Toronto Blue Jays (13): After piling up some phenomenal counting cat numbers at Double-A, Bichette has moved into our top five this year. 6. Jo Adell, OF, Los Angeles Angels (73): The Angels’ top prospect is expected to start the season back at Double-A after hitting extremely well across three levels last year. Adell is getting very close to joining Mike Trout in the Halo outfield. 7. Royce Lewis, SS, Minnesota Twins (24): The first overall pick from 2017 was hurt this spring, but wasn’t really expected to have a shot at the bigs anyhow. Lewis tore up Class-A last year, but wasn’t nearly as good at High-A over the last couple of months, so he likely needs another full year of seasoning. 8. Brendan Rodgers, SS/2B, Colorado Rockies (8): We’re likely a bit more bullish on Rodgers than most, having had him as a top 10 prospect two years running. Between 2006 and 2016, Rodgers was one of only six 19-year-olds that had a wRC+ between 130 and 140 with a strikeout rate below 25 per cent in the Sally League. The others? Delino DeShields Jr., Nolan Arenado, Trevor Story, Christian Yelich and Nomar Mazara. See why we’re so high on Rodgers? 9. Nick Senzel, 3B/OF, Cincinnati Reds (9): The oft-injured Senzel was supposed to get the first crack at the Reds’ CF job this season, but was surprisingly sent down to Triple-A. He’s likely ready after being very productive at Triple-A last year, albeit in an injury-shortened stint. 10. Jesus Luzardo, SP, Oakland Athletics (NR): More than any other prospect in 2018, Luzardo emerged virtually out of nowhere. The southpaw was sent from Washington to Oakland at the trade deadline in 2017, and has been crazy good since. The A’s challenged him by having him skip Class-A last year, and he didn’t miss a beat, earning another promotion after just three starts at High-A. Luzardo is going to win a lot of games as a major leaguer, but it will have to wait a bit as he’ll be shut down for a month in the wake of a shoulder injury. 11. Kyle Tucker, OF, Houston Astros (7): Tucker struggled in his first taste of the bigs last year, but raked at Triple-A. He’s looking more productive this spring and has to be considered a legitimate candidate for NL ROY thanks to his extra-base power potential. 12. Victor Robles, OF, Washington Nationals (4): Robles is at the head of the class in the Washington system, and another great reason (the other being Juan Soto) why the Nats were able to let Bryce Harper walk. Robles piled up the counting cats at Triple-A and was pretty productive in his first taste of the majors last year. 13. Michael Kopech, SP, Chicago White Sox (6): A year ago in these rankings, Kopech slotted out as the best pitching prospect in the game. He’s ceded that honour in the wake of Tommy John surgery that will sideline him for the season. Last year, Kopech wasn’t dominating at Triple-A and was very hittable in his brief time in the majors, so perhaps a bit more seasoning was in order. 14. Sixto Sanchez, SP, Miami Marlins (34): Part of the booty the Fish received in parting with J.T. Realmuto, Sanchez needs to develop into the pitcher that ranked atop the Philly system for this deal to really pan out for Miami. Last year, Sanchez dealt with injury issues, but racked up the Ks at Double-A while healthy. 15. Keston Hiura, 2B, Milwaukee Brewers (47): Now ascended to the top of the heap in Milwaukee, Hiura was taken ninth overall in 2017. He flashed some sweet extra base pop last year at High-A and Double-A and then really turned on the power at the AFL, leading the league in ribbies. 16. Wander Franco, SS, Tampa Bay Rays (NR): The top international prospect in 2017, Franco sure did not disappoint last year, absolutely raking at Rookie-Ball. We can’t wait to see what he does in full-season ball this year. 17. MacKenzie Gore, SP, San Diego Padres (28): The Padres have really built an impressive collection of young arms, and Gore is at the top of the list. The third overall pick in 2017, his changeup will be his bread and butter and he’ll really dominate based on his command reaching its potential. Ignore his pedestrian record at Class-A last year and focus on his stuff — he pitched much better than his ERA suggested. 18. Alex Reyes, SP, St. Louis Cardinals (15): Reyes is finally healthy in the wake of Tommy John surgery that cost him all of 2017 and most of 2018. There’s so much potential here… he just needs to stay on the field all year and do his thing. Reyes is an ace in the waiting if his medical woes are truly done. 19. Alex Kirilloff, OF, Minnesota Twins (NR): Kirilloff showed a solid walk rate at Class-A and continued to be productive at High-A, soaring into the top 20. He’s hit decently this spring and is likely to arrive in the majors some time next year. 20. Brent Honeywell, SP, Tampa Bay Rays (10): Still recovering from Tommy John surgery that cost him all of 2018, Honeywell was recently sent down to minor league camp. He’s been super stingy with the long ball throughout his minor league career and should finally make his MLB debut around June. 21. Yordan Alvarez, OF, Houston Astros (NR): After hitting extremely well at Double-A and then gaining some valuable experience at Triple-A last year, Alvarez looks like a future middle of the lineup bat for the Astros. 22. Brendan McKay, 1B/SP, Tampa Bay Rays (41): The Rays are building a strong team of the future, and two-way star McKay is a big part of that. As a hitter, last year he showed amazing strike zone judgment at Class-A, but his walk rate came down to earth at High-A. As a hurler, he was dominant at Rookie-Ball, went undefeated through six starts at Class-A and then enjoyed a solid hit rate at High-A. It will be interesting to see if he continues as both a hitter and pitcher as he gets closer to the bigs. 23. Peter Alonso, 1B, New York Mets (NR): There may not be a prospect in the game that has the same kind of power potential as Alonso, who tied for the minor league lead with 36 bombs over two levels last year. His groundball rate was up a smidge at Double-A before a promotion to Triple-A, where his line drive rate regressed a tad. 24. Casey Mize, SP, Detroit Tigers (NR): Based on a very limited sample size (185 pitches as a pro), Mize looks like a groundball pitcher. While many experts have him as a top 20 prospect, we really want to see what he does in his first full season before going all in. 25. Luis Robert, OF, Chicago White Sox (17): Robert is considered the centrefielder of the future for the Pale Hose, and a key part of their rebuild. First order of business is keeping him healthy this year, and that will go a long way towards finding him back in the top 20 again. Realistically, Adam Engel will only be able to hold off Robert for so long. 26. A.J. Puk, SP, Oakland Athletics (27): Taken sixth overall in 2016 out of Florida, Puk is in a similar boat to Honeywell this year, currently working his way back from Tommy John surgery that cost him all of last season. If not for that, he’d be projected to be one of the top arms in the minors. Still, given his electric arsenal, don’t be shocked if he forces his way to Oakland sometime in the second half. 27. Mitch Keller, SP, Pittsburgh Pirates (21): The 64th overall pick in 2014 is being counted on to help prop up the Pirate rotation very soon. After showing a decent K rate at Double-A and then upping that significantly at Triple-A last year, Keller is on the cusp of reaching the majors. A poor spring indicated more seasoning is needed, but he could very well be a factor in Steel City in the second half. 28. Chris Paddack, SP, San Diego Padres (NR): This righty has opened some eyes this spring thanks to improved fastball command and his already top-notch changeup. The hype has Paddack soaring up prospects charts with many suggesting he can help Fantasy teams this year. His ADP right now is 416, but he’s a legitimate sleeper for 2019. 29. Mike Soroka, SP, Atlanta Braves (40): Atlanta has a ton of young arms on the way, headed by Soroka. He has a chance to be a special talent, but his shoulder woes — which have returned this spring — are a concern. 30. Hunter Greene, SP, Cincinnati Reds (23): The second overall pick in 2017 has amazing strikeout potential (nearly 12/9 over his two pro seasons), but he slipped a bit in this year’s rankings after posting an ERA of nearly four and a half at Class-A last season. 31. Garrett Hampson, 2B/SS, Colorado Rockies (NR): There’s talk that Hampson could be on the weak side of a platoon at second base to begin the year, but he has the potential to be a much greater factor than that in time. He’s been pigeonholed as a utility guy in the making for some time now, but as he just kept hitting in the minors, he has shown he’s more than just a great gloveman and could be a legitimate starter in the bigs. Hampson’s blocked right now, but don’t give up on him in dynasty formats. 32. Jarred Kelenic, OF, Seattle Mariners (NR): Dealt to the Mariners in the Robinson Cano/Edwin Diaz trade, Kelenic looks like a star in the making. He’s seen very little action this spring, but last year he enjoyed an impressive pro debut, tearing up the GCL (1060 OPS) before racking up a goodly amount of total bases in the Appy League. Kelenic was one of the Mets’ best prospects, and now he’ll play a key role in the Mariner rebuild. 33. Kyle Wright, SP, Atlanta Braves (43): Wright has a chance to be one of the top rookie hurlers this season. Atlanta’s second-best prospect didn’t have a great ERA at Double-A last year, but was nearly unhittable during his time at Triple-A. 34. Carter Kieboom, SS, Washington Nationals (NR): Kieboom is opening some eyes this spring, particularly by taking Justin Verlander deep twice in the same game. He’s going to be a middle of the order hitter in the majors before you know it. 35. Drew Waters, OF, Atlanta Braves (NR): One of the Braves’ top prospects, Waters is a player we’re a lot more high on than most. This kid, who reached High-A at age 19 last year, will team with Cristian Pache to form two-thirds of Atlanta’s future outfield. 36. Joey Bart, C, San Francisco Giants (NR): San Francisco’s first round pick last year (No. 2 overall) hit the ground running as a pro in 2018, and he’s still raking this spring. In fact, Bart’s performed well enough that his timetable has been accelerated with some now believing he’ll be with the Giants by the second half of this season. He’s an impressive looking hitter at a position where that’s at a serious premium right now. 37. Triston McKenzie, SP, Cleveland Indians (18): McKenzie has some serious upside, but there are health concerns. For the second straight season, an injury will delay his start, this time a back woe that will cost him six weeks. When healthy, McKenzie is capable of logging some major quality innings. 38. Austin Riley, 3B, Atlanta Braves (NR): A third baseman throughout his minor league career, Riley has been used at first base and outfield as well this spring as he tries to expedite his arrival in the majors. He’s a very productive hitter with solid extra-base pop, but Atlanta’s signing of Josh Donaldson has him blocked for 2019. 39. Nolan Gorman, 3B, St. Louis Cardinals (NR): We’re a lot more bullish on Gorman than most, but finding a third base prospect that can be a legitimate building block isn’t easy. Last year, he hit the cover off the ball in his pro debut in the Appy League, prompting a promotion to Class-A, where he got some valuable experience. Expect Gorman to really take a step forward on the prospect ranks this season. 40. Dylan Cease, SP, Chicago White Sox (64): In time, Cease is likely to become the No. 2 starter for the Pale Hose. He was recently demoted to minor league camp, but after giving up just 6.5 H/9 at High-A and going undefeated through 10 starts at Double-A last year, he’s getting close to making the Show. 41. Nick Madrigal, 2B/SS, Chicago White Sox (NR): When the White Sox took Madrigal with the fourth overall pick last year, we called him the new Dustin Pedroia. And with just Yolmer Sanchez standing in his way, it won’t be long before Madrigal makes it to the bigs. 42. Jesus Sanchez, OF, Tampa Bay Rays (61): The Rays have yet another elite prospect on their hands in Sanchez. He was young at High-A last year, yet flashed some decent pop, and then was a boy among men at Double-A, gaining some valuable late-season experience. Sanchez should hit the ground running at Double-A this year, with a possibility of forcing a late-season cup of coffee in the majors. 43. Nathaniel Lowe, 1B, Tampa Bay Rays (NR): And we have yet another Ray prospect. Lowe hasn’t been hitting well this spring, but he sure has flashed the pop, including some majestic blasts. He’s now the third best first base prospect in the game after driving in over 100 runs over three levels last year. 44. Andres Gimenez, SS, New York Mets (NR): Gimenez was recently reassigned to minor league camp, but given how aggressive the Mets have been with this kid (promoting him to Double-A after just 85 games at High-A), we think we’ll be seeing him in the majors before long. He took a massive step forward in his development last year; this season, we’ll see if he can force his way to Citi Field. 45. Travis Swaggerty, OF, Pittsburgh Pirates (NR): The 10th overall pick last year, Swaggerty has some sweet speed and raw power that will likely manifest itself in games more over time. In his pro debut last year, he was fairly productive at both Low-A and Class-A. We’ll know a lot more about him based on how he fares this season and whether he deserves to remain in the top 50. 46. Trevor Larnach, OF, Minnesota Twins (NR): Larnach has some serious raw power, which he’s flashed already this spring. He was taken 20th overall after a strong showing at Oregon State, and it didn’t take him long (just 75 plate appearances) to get bumped up from Rookie Ball to Class-A, where he continued to be productive. 47. Jonathan India, 3B, Cincinnati Reds (NR): India is another prospect we’re a bit more high on than most. In his pro debut last year, he got a taste of the Pioneer League (10 plate appearances) and was then bumped up to the Appy League, where his BABIP wasn’t as high, yet he still hit for a decent BA. India then spent the rest of the season at Class-A, where he started to show off his speed, which was nice to see as it isn’t considered his strongest skill. 48. Jon Duplantier, SP, Arizona Diamondbacks (83): Recently cut from the Snakes’ Spring Training roster, Duplantier will clearly be back in short order. He dealt with some injury issues that slowed him last year, but proved he can win at Double-A upon his return. All he needs now is a bit more experience under his belt. 49. Alec Bohm, 3B, Philadelphia Phillies (NR): The Phils were able to sign the No. 3 pick from last year’s draft for substantially below slot money even though his power potential is through the roof. In his pro debut, Bohm showed superb contact rates at Rookie-Ball before beginning to flash his extra-base prowess at Low-A. His first full season will be telling, but there’s some nice upside here. 50. Yusniel Diaz, OF, Baltimore Orioles (NR): Diaz was recently reassigned to minor league camp as he needs a bit more time in the minors. Last year, his line drive rate was down at Double-A before he was dealt to B-More in the Manny Machado trade. Once with the O’s Double-A team, it continued to dip, so that’s definitely something to keep an eye on this season. 51. Brusdar Graterol, SP, Minnesota Twins (NR): We’re a bit higher on Graterol than most, but we just really like the fact that he throws strikes. His command was off the charts at Class-A, and he proved he can win at High-A. This kid is ready for the next challenge. 52. Kevin Smith, SS/3B, Toronto Blue Jays (NR): The Jays have plenty of middle infield prospects, and Smith is one of the best of the bunch. Last year, he played at second, third and shortstop, spending the majority of his time at the latter position. This versatility will likely help expedite Smith’s arrival in the bigs, but could also pigeonhole him into a utility role. 53. Luiz Gohara, SP, Atlanta Braves (35): Gohara, dealing with a shoulder woe this spring, was optioned to Triple-A recently. Let’s hope he can get healthy soon, because 2018 was kind of a lost year for him as his velocity was down, and he barely employed his changeup at all. If Gohara can get that hard slider back, he can really help the Braves this season. 54. Jonathan Loaisiga, SP, New York Yankees (NR): Loaisiga had been struggling this spring until recently, but it’s probably not enough to make the team’s rotation, even with injuries to Luis Severino and CC Sabathia. Clearly, Loaisiga is still blocked, but his time is coming. Armed with a fastball, curve and changeup, he has some serious upside. 55. Jahmai Jones, 2B, Los Angeles Angels (NR): Jones could make a nice impact on the Angels in the near future. He could score a lot of run as a future top of the order hitter, making him a nice keeper league target, assuming he’s already owned in dynasty formats. 56. Michel Baez, SP, San Diego Padres (51): The Padres are loaded with talented young arms, and the right-handed Baez is one of the finest. Last year, he was stingy with the long ball at High-A, but went winless after a late-season promotion to Double-A. Despite a poor record, Baez’s peripherals were impressive. This is a key year for his development as he tries to master Double-A. 57. Brandon Marsh, OF, Los Angeles Angels (NR): A second round pick in 2016, Marsh has put up some impressive counting cat numbers early in his pro career (132 runs, 114 ribbies in 166 games). He’ll need to improve his contact rate going forward, but this kid looks like a future staple in the Angel outfield. 58. Matthew Liberatore, SP, Tampa Bay Rays (NR): Liberatore gives the Rays six prospects among the top 60. Last year, he was the top high school southpaw in the draft, and while he won’t overpower hitters with triple digit heat, he really mixes up his advanced repertoire well to dominate. 59. Cristian Pache, OF, ATL (NR): Pache has gotten tons of action this spring as the Braves assess their young stud flyhawk. Last year, the Dominican hit very well at High-A, earning a bump to Double-A, where his counting cat numbers proved harder to come by. Still, his showing this spring proves he’s not far from making the Show. 60. Xavier Edwards, SS, San Diego Padres (NR): Edwards made his pro debut last year, failing to show any power at Rookie level or Low-A. However, his ability to draw walks, hit for a superb BA and steal bases makes him an ideal leadoff hitting prospect. The Padres are very high on this kid, so he bears close watching as he enters full-season ball in 2019. 61. Ryan Mountcastle, 3B, Baltimore Orioles (NR): Oriole fans don’t have much to look forward to in 2019, but at least the team finally has a couple of prospects to get excited about. Recently reassigned to minor league camp, Mountcastle — the 36th overall pick in 2015 — built on a big 2018 at Double-A with a very strong spring, so chances are he’s not that far away from Charm City. 62. Taylor Trammell, OF, Cincinnati Reds (48): Trammell didn’t have much of a chance to win a job this spring, but an injury and poor performance sealed his fate of returning to the minors. Last year, his pop dipped in High-A, but he showed really strong on-base skills, and he consolidated that performance by putting up some decent counting cat numbers in the AFL, where he flashed great speed and a good approach at the plate. 63. Luis Urias, 2B, San Diego Padres (54): If Urias doesn’t break camp with the Padres, he certainly won’t be in the minors for long. This kid is going to make an impact this season, likely as the leadoff hitter. Urias hit well enough at Triple-A last year that it’s clear he’s going to deliver solid at-bats and do a good job of getting on base in the bigs. Urias has great contact skills and some nice gap power. 64. Brent Rooker, 1B/OF, Minnesota Twins (NR): A huge star in the SEC in college, Rooker already progressed to Double-A last year, leaving him within a hop, skip and jump of the majors. The kid has pop, and as soon as he cuts down on the Ks, he’ll be ready for the next step. Watch his strikeout rate closely this season. 65. Adrian Morejon, SP, San Diego Padres (69): Did we mention the Padres have a wave of pitching talent on the way? Morejon’s injuries in 2018 slowed him from soaring much higher on this list, yet he still racked up a goodly amount of Ks in High-A. He’ll need to stay healthy this year to have a shot at pitching in the bigs. 66. Juan Pablo Martinez, OF, Texas Rangers (NR): Once Shohei Ohtani came off the market, Martinez became the most coveted international free agent last year. Texas landed Martinez for $2.8 million, and his youth, power and speed make him an extremely intriguing prospect. Expect him to take over the centre field job for Texas by mid-season. 67. Brady Singer, SP, Kansas City Royals (NR): KC’s first rounder from last year has yet to make his pro debut, but the former Florida ace could begin his pro career at High-A because of his pedigree. The Royals are bereft of prospects, so Singer’s development is vital to the organization. 68. Michael Chavis, 3B, Boston Red Sox (65): Chavis will return to Triple-A this year for the BoSox, looking to mash his way to Beantown. The corner infielder slipped in the rankings slightly this year after missing most of last season to a PED suspension. Still, given the power display he put on this spring, he’s just an injury away from being recalled for his MLB debut. 69. Seuly Matias, OF, Kansas City Royals (NR): KC is criticized for its lack of high-end prospects, but Matias has a chance to quiet that talk. He’s easily among the top 35 dynasty outfield options given his immense raw power; it’s just a matter of taking a more advanced approach at the plate and making better contact for him to get to the next level. 70. Ian Anderson, SP, Atlanta Braves (67): Man, the Braves are stacked with pitching prospects. Anderson has slid slightly from our Top 85 Prospects a year ago as he again had a substandard (if misleading) record. Still, he stayed healthy and High-A and pitched even better after a late-season promotion to Double-A. 71. Daulton Varsho, C, Arizona Diamondbacks (NR): Part of the next wave of catching prospects that will ideally get us out of the current state of positional weakness, Varsho is listed at 5’10”, but that may be a couple of inches generous. Even so, he runs like a poor man’s Kirby Puckett and is surprisingly good on D. Varsho was in camp with the Snakes this spring as a non-roster invitee. He’ll be back for good before long. 72. Seth Beer, OF, Houston Astros (NR): Beer has a swing reminiscent of Freddie Freeman, but his fielding ability (or lack thereof) will likely doom him to a DH role down the road. Still, after getting taken in the first round last year, Beer excelled in a half season of minor league ball, rising all the way to High-A, gaining some valuable experience along the way. His ceiling may be capped, but he’s coming quickly. 73. Corbin Martin, SP, Houston Astros (NR): While he hasn’t exactly been racking up the Ks this spring, Martin has generally had good results. Last year, he went undefeated at High-A, earning a quick promotion to Double-A, where he looked very strong. Martin could get a cup of coffee this September. 74. Khalil Lee, OF, Kansas City Royals (NR): Some consider Lee the top position player in the Royal system, but we slightly prefer Matias. Still, Lee — KC’s third round pick in 2016 — has a hell of an arm, and a nice combination of raw power and speed. The improvements in his batting eye last year helped launch him onto our list this season. Lee is a toolsy player, but his swing is a tad long. 75. Francisco Mejia, C, San Diego Padres (11): Expected to be one of the NL’s top rookies this season, Mejia will need to beat out Austin Hedges for PT to truly make an impact. Mejia’s bat will play, but he needs to improve his work behind the plate, because his Fantasy prospects will plummet if he’s no longer a catcher. 76. Josh Naylor, 1B/OF, San Diego Padres (NR): As big as a house (maybe a subdivision), Naylor is all about the power, something he exhibited this spring. Last year, his speed waned for the second straight season, but we love the dramatic improvements he made in his strikeout rate. A power hitter with a great batting eye? Sign us up. 77. Estevan Florial, OF, New York Yankees (52): Florial broke his wrist this spring, so that will keep him out of commission for a couple of months. He had trouble staying healthy last year, so didn’t hit as well at High-A as he had in 2017, when he looked like a much better prospect. Still, Florial has flashed future leadoff man type skills, so bears watching to see how he responds once he’s healthy again, but after a substandard showing in the AFL in 2018 when he looked lost, his stock appears to be falling. 78. Josh James, SP, Houston Astros (NR): James has been getting plenty of hype given his strikeout potential. Last year, he was too wild at Double-A, but proved unhittable at Triple-A, earning a call to the majors. With Houston, James’s K rate dipped again, but was still very strong. This kid is going to rack up some punchouts, peeps. 79. Monte Harrison, OF, Miami Marlins (NR): There’s great opportunity for Harrison to be a key building block for the rebuilding Marlins. Last year at Double-A, the toolsy flyhawk’s groundball rate was up, but so was his infield fly rate. Harrison has a rifle for an arm, and his raw pop and speed are exciting, but he’s not likely to ever hit for much of a BA as he doesn’t seem to have a clue about the strike zone yet. Until he figures that out, the Ks are going to pile up. 80. Dustin May, SP, Los Angeles Dodgers (NR): May could very well factor into the Dodgers’ plans this year pending the health of the rotation. A groundball pitcher, he showed good control at both High-A and Double-A last year. May’s devastating slider will take him far. 81. Austin Hays, OF, Baltimore Orioles (30): When Hays was given a 20-game look in 2017 in the majors, he clearly wasn’t ready. And thanks to an injury-shortened season last year, he stayed in the minors and struggled, hence the drop in his rankings. Still, Hays did cut his strikeout rate last year, so it wasn’t all bad news. This is a very important season coming up for one of B-More’s biggest hopes. 82. Alex Verdugo, OF, Los Angeles Dodgers (25): Verdugo is slated to begin the season in the bigs despite a so-so spring. Last year, he showed his pop at Triple-A, and hit better during his time with the Dodgers, as pitchers attacked him with fewer fastballs but more offspeed stuff. 83. Dane Dunning, SP, Chicago White Sox (NR): Many are a bit higher on Dunning than us, and while the 29th overall pick from 2016 made excellent progress last year, he’s going to miss all of 2019 in the wake of Tommy John surgery, so he’s only of interest in Dynasty formats at this time. 84. Touki Toussaint, SP Atlanta Braves (NR): Toussaint took some licks this spring, but also flashed his promise at times. His fastball sits around 93-94 mph, his split finger is around 85 mph, and his curve — which is his bread and butter pitch — is around 76 mph. 85. Heliot Ramos, OF, San Francisco Giants (NR): Ramos is San Francisco’s No, 2 prospect and the team is excited by his power-speed package and the fact he held his own as the youngest player in the Sally League last year. The Giants failure to land Bryce Harper is great news for Heliot, assuming he doesn’t get blocked by someone else over the next year or two. 86. Keibert Ruiz, C, Los Angeles Dodgers (NR): One of the top catching prospects in the game, Ruiz was recently sent to the minor league camp. After gaining some good experience at Double-A and then putting in a decent AFL showing last year, it won’t be long before he sees his first MLB action. 87. Christin Stewart, OF, Detroit Tigers (NR): The left fielder has been very productive, driving in 86 runs across two levels in 2017 and then adding 80 last year across three levels before driving in another 10 in his first taste of the majors. Stewart won’t swipe many bags, but should be a nice source of power while hitting for a decent BA. 88. Matt Manning, SP, Detroit Tigers (60): The Tigers finally have some nice pitching prospects on the way, and Manning is one of the best of the bunch. A 2016 first round pick, he improved his control last year while showing more consistent command — especially with his curveball. Manning likely needs one more year of seasoning, but if he progresses like he did last year, he’ll be in Detroit before long. 89. Kristian Robinson, OF, Arizona Diamondbacks (NR): This 18-year-old was signed out of Bahamas in 2017 and his ceiling is through the roof. Robinson made his pro debut in the Arizona League, getting some good experience before moving up to the Pioneer League, where he got some valuable at-bats. We’ll get a much clearer picture of how good he is this year when he tackles full-season ball. 90. Justus Sheffield, SP, Seattle Mariners (58): Sent to the Mariners in the James Paxton deal, Sheffield will likely be a fixture in the Seattle rotation by 2021 if not before, likely with the upside as a No. 2. Last year, Sheffield had a stellar ERA in Double-A, worked mostly as a starter in Triple-A and then had a brief cup of coffee with the Yanks in September. The cocky and self-assured lefty should force his way into the rotation at some point this year. Now it’s your turn. Let us know in the comments below who is too high, too low or perhaps missing from this list. This entry was posted on Tuesday, March 26th, 2019 at 4:52 pm	and is filed under BASEBALL, Prospects, RotoRob, Scouting Report. You can follow any responses to this entry through the RSS 2.0 feed. You can skip to the end and leave a response. Pinging is currently not allowed.